We will collaborate with your team to establish a user experience and interactive strategy, with a focus on innovative capabilities and business growth strategies. Along the way, we can help you leverage research techniques to make data-driven design decisions (D4). Our practices emphasize progressive techniques to help you create products and/or services which engage and delight the people who use them. Ideation & Brainstorming Workshops facilitated by our team and guest experts custom-tailored for you and your organization. Establish a baseline of the theoretical, then go beyond to immerse you and your colleagues in practical world of innovative product and services design. Get serious about taking your organization to the next level, through workshops geared to transform innovation from a buzzword to a practice that are purposeful and action-oriented. Garofalo UX consultants who have years of real-world experience implementing agile practices in software development processes and business operation processes. A key transformation aspect is to understand current capability and business goals allowing for a transition strategy to be developed that is focused on enhancing operational efficiency as they adopt agile approaches. Garofalo UX has first-hand experience creating a software-as-a-service (SaaS) product. Our professionals have a specialty in user experience and agile practices. Our coaching will help you and your team focus on producing results, while sharing with you our experience and expertise, at a predictable cost. Garofalo UX consultants have past project experience crafting user interfaces for industrial safety use-cases. One key element is ensuring your staff have the appropriate information at the time they need it. We live in an experience economy. Not all businesses and organizations can sustain having their own in-house UX design and research staff, but every organization creating apps, software, and other technologies should have professional UX design and research services available to them when needed. Garofalo UX has experience with providing on-going UX expertise and assistance to businesses and organizations of all sizes. Ask about our monthly retainer discount on hourly time and materials consulting, with a three (3) month minimum. All of the services listed above are available as part of a monthly retainer. Need UX design help that is budget-friendly? Need to augment your in-house UX design team? Don't have a UX design team? We're here to help with UX design-help subscription plans. Each plan lets you schedule a number of phone consultations with a UX expert on a monthly basis. Consultations are peer-review critiques of a design document your team has created. Results-oriented with highly-qualified user experience experts, while benefiting from an enhanced level of neutrality and less politicizing of activities and issues. Our temporary augmentation of your team may offer the perfect solution. Garofalo UX will walk your team through a series of activities to review the services offered by your organization. 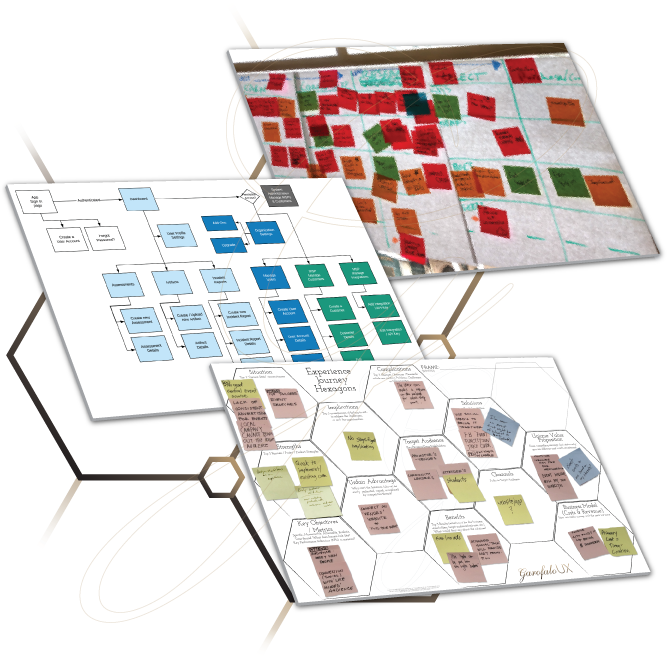 Planning and organizing people, infrastructure, communication, and material components are four common attributes to service design. Using methods and techniques derived from a blend of ethnography, information science, and management science, Garofalo UX is ready to provide a detailed, action-oriented analysis of your service offering, to improve its quality and the interaction between your team members and your customers. Designing services according to both the needs of your customers as well as the competencies and capabilities of your organization, can help to set a competitive advantage.